Our Hair transplant provides natural and undetectable results. No cumbersome post-op maintenance is necessary. Just like your natural hair, you can dyeand cut your transplanted hair. It is not like a hairpiece, so you won’t be restricted from enjoying your favorite activities such as running, swimming, and just any other physical activity. As your hair begins to thin and bald, hair transplantation is a perfect way to replace those areas before they become significantly noticeable. The best thing about it is that it’s your own hair. Continuous hair growth that lasts for a lifetime. After all its your Own Hair!!! Hair transplantation is a surgical procedure, which moves the hair follicles from one portion of the body part, preferably scalp (known as ‘donor site’) to the bald portion of the body called the ‘recipient site’.This procedure requires grafts comprising hair follicles taken from the donor area, which are resistant (genetically) to hair loss and are transplanted to recipient area, usually the scalp. It can also be used for restoring beard hair, eyebrows, eyelashes, public hair, chest hair and for filling up scars that are caused by surgery like previous hair transplants and face lifts or prior accident. Modern hair transplant techniques can obtain a natural appearance if done by an experienced surgeon and mimic natural hair. The male pattern baldness is usually is caused by increased sensitivity of hair to male hormone testosterone that is produced in increased amounts, at puberty. The hormone is then converted into DHT (dihydrotestosterone) by an enzyme (called 5-alpha reductase type-II). The enhanced DHT presence, in the long run causes hair to get thinner, lose pigmentation and to finally stop growing. In hair transplant, the result depends largely on the quantity of hair that is present in donor area. The hairs at the back of the scalp (i.e. the occipital area) are inherently resistant to balding effects as these hairs lack the DHT receptors. Hair transplant is a surgery which trasnsfers the permanent hair to the bald/thinning areas. After the relocation of the grafts, the hair will keep growing for a lifetime. It will have the same characteristics as the hair from the donor site i.e. size, quality, growth speed and the same lifespan. However relocation of hairs have some limitations too. It is a growth of one to one ratio. It will increase the number of hairs at recipient site but with the same number of hair lost from the donor site. 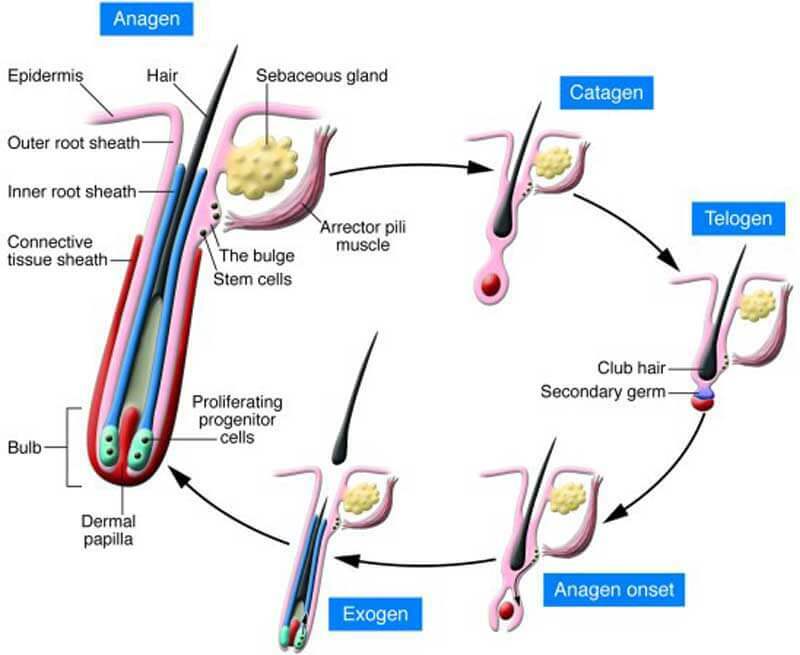 The transplanted hairs will have a good lifespan, but other natural existing hair may fall off due to hormone excess. It’s unrealistic to expect no further hair loss will occur, even after a procedure. A hair transplant cannot prevent future hair loss. Finally, in a patient with active hair loss, prevention of further hair loss is very vital. A hair transplant can’t help this but medication can. Patients must seriously consider taking the medication after the surgery. The procedure begins with the surgeon removing a donor strip from the donor site, which is often located on the back or side of the scalp. The donor strip is further cut into single, double or triple grafts. The grafts are inserted into pre-cut micro slits that are strategically designed to aesthetically improve the density of your existing hair, lower the hairline, and fill in balding areas. 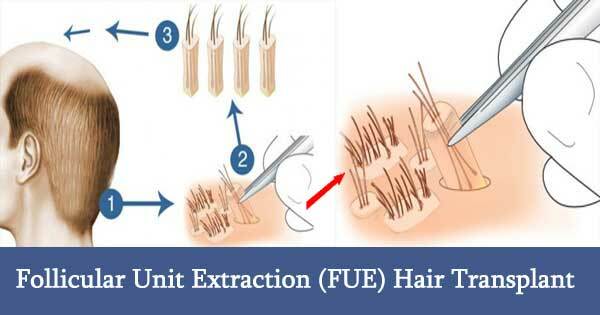 FUE (Follicular Unit Extraction) is a procedure to harvest the donor hair individuallyusing a punchto create tiny incision around the hair, in the skin, thus separating it from the tissue surrounding it. Then, the unit is directly extracted (pulled) from the scalp that leaves a tiny wound. This surgeon extracts the so-called follicles individually. These are small groups of hair roots, which are then transplanted onto the bald area or on the regions with thin hair growth. An advantage compared to the Strip method in FUE (single follicle removal) is that it is possible to dispense with oblong incision with scarring. Instead, the individual follicles are manually punched out with hollow needles that have a tiny diameter. However, it requires a shaving in the donor region at the back of the head when removing. Transection: The rate of transaction can be diminished by using magnification loupes of good quality or a microscope unit, combined with experience and expertise. Dehydration: Utmost care should be taken for keeping the graft moist and this is achieved by using cold RL/NS Solutions. This refers to the stress found in hair follicles and is experienced, when kept out of body for a good amount of time. Stress takes place, because of lack of blood supply, oxygen, follicular nutrients, exposure to extreme temperatures, including pH shift. Once graft is kept in the tissue bed, it then re-exposes to oxygen and sets off a production series of free radical, which might have an effect on graft survival (Ischemia–Reperfusion Injury). This refers to the immediate Post-operative oxygenation & revascularization, unlike other organ transplants, where the tissue gets hooked into a new blood vessel. In case of hair transplant, where there is an absence of vascular anastomosis, the Follicular Units can be termed as free grafts that tend to absorb oxygen passively from the tissues that surround it. As with all types of surgeries, there may be side effects that may last temporarily until the healing process is over. It is very typical for patients to experience none to some of these side effects. These side effects are only temporary, and will disappear on their own or with simple medications. The implanted area may be pink, and the skin slightly shiny. It may last from two weeks to six weeks. After the surgery, it is normal for some pre-existing hair to thin. The pre-existing hair will return to normal in full condition within a few months after the surgery. Some bleeding is normal and will stop with simple pressure. Pain is usually fairly minimal and lasts only a few days. 70% of our patients do not require any pain relievers. Some transient numbness is inevitable, and usually lasts from one to sixteen weeks. It is rarely bothersome or long-lasting. Some itching commonly occurs but is rarely troublesome and lasts only a few days. Shampooing the hair daily will help the discomfort. There is some swelling in nearly all cases. It affects the forehead and the area around the eyes and lasts two to five days. In about one in hundred cases, a “black eye” develops. One or more cysts may occur in the recipient area. They usually disappear by themselves after a few weeks. Patients usually feel minimal or no pain, and can return to work the very next day. Within 6 months of the procedure, the transplanted hair can be groomed and combed in any fashion you like. Hair Transplantation is a surgical process of allocating donor hairs from the back of the head to the balding area. 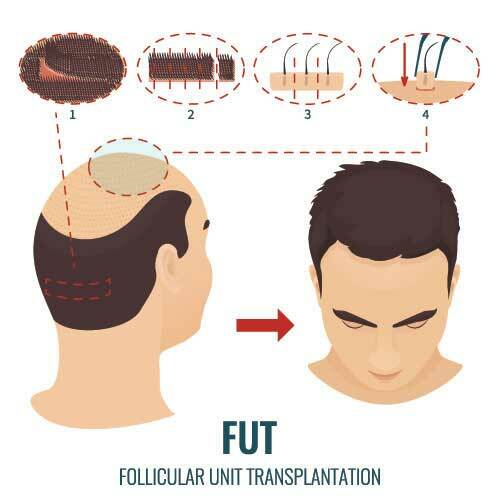 Results of Hair Transplantation depend on the amount of donor hair available. After the surgery is complete, the results should appear within the next couple months. This time chart depicts the growing cycle of the newly transplanted hair after the surgery. Bandages can come off. Soreness may be felt at the donor area. Tiny scabs on graft area will start to disappear. Transplanted hair will fall out. New hair starts to grow. Transplanted hair continues to grow and thicken. Final appearance of procedure is usually present. Patients typically experience psychological as well as physical pain when facing surgery. To help reduce any physical discomfort, we use the finest needles available. We apply a vibration before the injection, warm up the local anesthesia, and perform nerve blocks. To further ensure the comfort of the patient, we pre-numb the skin before applying the stimulus anesthesia agent. Tumescent anesthesia is used to make the anesthesia last longer than 10-15 hours. Furthermore, to ensure our patients’ comfort after surgery, we provide the latest, best oral pain reliever. Platelet Rich Plasmas was first introduced in the 70s and since then went on to become an effective and popular procedure for restoring hair growth. Activated platelets are known to release different Growth Factors (GF) towards effective hair growth. PDGF: Platelet Derived Growth Factors. PDAGF: Platelet Derived Angiogenesis Growth Factors. VEGF: Vascular Endothelial Growth Factors. Such growth factors tend to stimulate collagens and new blood vessels to be produced from the White Blood Corpuscles (WBC). Miniature hair is may be noticed in bald head (irrespective of the region of baldness), which means that hair/hair roots are present, however, in inactive form. They do need certain triggering external force for becoming active. Platelet Rich Plasma (PRP) is considered to be that external triggering force, with the help of which the miniature hairs do become active and successfully forms thicker hair roots and to have lush hair growth. Whole blood of 20ml is collected from peripheral veins and later transferred to test tubes that contain sodium citrate. The test tubes are centrifugedto retrieve PRP (platelet concentration here is much greater, more than five times the normal value). Multiple minute holes are created in the scalp region with the assistance of derma roller. PRP is then injected in the scalp region.